Hip pain can be caused by a number of injuries or conditions. The most common cause of hip pain is inflamed tendons. Hip and groin pain can be related to a range of muscle or joint problems or it could be referred pain from your lower back. Your osteopath will analyze your lower back and lower limb movement to help determine the cause of your pain. Because the hip is the centre of movement between the upper and lower parts of the body, it can easily be affected by poor movement control, posture or exercise. Hip joint pain is often caused by a sitting position, landing awkwardly, certain sports, a sedentary lifestyle or arthritis. 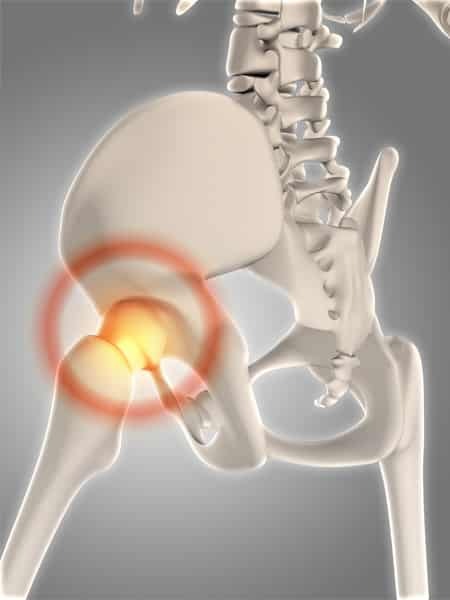 Hip joints can become sore when are held in a fixed position for a long time, or repeatedly moved into an uncomfortable position. Muscle pain often occurs in people who perform repeated sideways movements such as soccer players, dancers and AFL players. Many minor conditions can be painful but usually heal within a few days. For muscular pain, your osteopath will look at the other muscles around your hip and groin to understand the cause of your discomfort. Longer-term pain may be caused arthritis or bursitis. If pain is caused by arthritis your osteopath can help but may also suggest you see a GP for any additional medications or treatment. Your osteopath will work with you to improve your posture, discuss the way you move or why you may be experiencing hip problems.